Learn how to create a pretty chevron pattern with Anna Nikipirowicz and learn the ZigZag stitch in the Stitch School! The zigzag stitch, also sometimes known as chevron, it is a great stitch for home decor and accessories, it also looks fab as an edging. It’s made by placing increases and decreases in the correct places. k1 f&b – which means knit 1 into front and back of same st.
Sl1 k1, psso (left slanting decrease) – slip 1 st, knit next st and pass the slipped stitched over the knitted one. 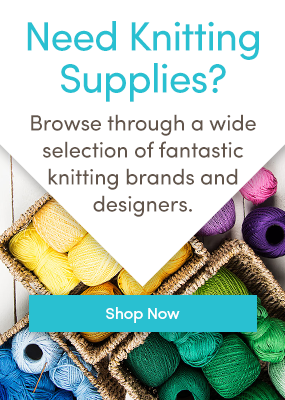 I’ll be using Cascade 220 and 4.50 mm knitting needles. The stitch is worked in a multiple of 14 sts, plus 2. For my sample, I’ve cast on 30 sts. Row 2: k 1, k1 f&b in next st. To do this, knit into a stitch and leave it on the needle, knit through the back loop of the same stitch, slip both stitches off the needle. Knit 4, sl1 k1 psso. To do this, insert your right-hand needle into the next stitch, as if to knit, then slip that stitch to the right-hand needle, knit the next stitch, insert the tip of left needle in the slipped stitch and lift it over the knitted stitch and off the needle. You can see how the decrease slants to the left. K2tog, to do this, insert the right-hand needle into the next two stitches on the left needle and knit those two stitches as one. You can see how the decrease slants to the right. K4, *[k1 f&b] twice, k4, sl k1 psso, k2tog, k4, rep from * to last 2 sts, k1 f&b, k1. Row 2 is now complete and it should look like in the pic below, you can see the weaves forming. Here is row 2 written in full: k1, k1 f&b, k4, sl1 k1 psso, k2tog, k4, * [k1 f&b] twice, k4, sl1 k1 psso, k2tog, k4, rep from * to last 2 sts, k1 f&b, k1. The 4 rows form the pattern, repeat for desired length. Why not make it in stripes, just changed change colour every 2 rows! We’d love to see your fabulous Zig Zag projects! Upload them to our Community! If you enjoyed this post why not Pin it? Mi piace moltissimo , proverò a realizzarlo , c’e un piccolo problema che le spiegazioni sono in inglese ed io ne conosco un pò, si può avere iniitaliano, ne sarei molto interessata.grazie mille. Cordiali saluti da Vincenza Macaluso.